For the St. Louis Rams, training camp for the 2009 NFL season kicked off with a huge technology upgrade to its training facility and office complex in Earth City, Mo. Bringing the organization to the cutting edge of IT and A/V technology, the Russell Athletic Training Center’s makeover included a new HD IP-TV system to replace the facility’s standard-definition analog SMATV, a ShoreTel VOIP phone system to replace the old analog system and a facility-wide digital signage network. To design and install the new systems, the Rams turned to Missouri-based integrator TSI Global. 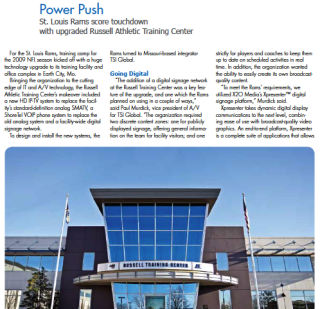 “The addition of a digital signage network at the Russell Training Center was a key feature of the upgrade, and one which the Rams planned on using in a couple of ways,” said Paul Murdick, vice president of A/V for TSI Global. “The organization required two discrete content zones: one for publicly displayed signage, offering general information on the team for facility visitors; and one strictly for players and coaches to keep them up to date on scheduled activities in real time. In addition, the organization wanted the ability to easily create its own broadcast-quality content. “To meet the Rams’ requirements, we utilized X2O Media’s Xpresenter™ digital signage platform,” Murdick said. Xpresenter takes dynamic digital display communications to the next level, combining ease of use with broadcast-quality video graphics. An end-to-end platform, Xpresenter is a complete suite of applications that allows users to create dynamic content for their digital displays quickly and easily, distribute the content and monitor activity on the displays using powerful remote management tools. X2O’s Xpresenter “smart” templates allow users to create and update content directly inside Microsoft PowerPoint. The product ships with a smart template and object library, allowing for the quick and simple creation of content featuring videos, images, PowerPoint slides, RSS feeds, live information sources and more. The Xpresenter Player maps the live information to the templates and renders them in broadcast quality and in real time, ensuring displays are always up to date. Content at the 9,000-square-foot Rams’ facility is displayed on Sony 42-inch and 52-inch LCD screens located at 20 digital signage points. In the public signage zone, content includes Rams videos, local weather, special announcements, news and customized greetings for VIP visitors. On the internal side of the network, Xpresenter is synched with facility scheduling programs, such as daily training schedules and other agenda items. Through the Web-based X2O Portal, which incorporates different security levels for users, this content can easily be scheduled to display in broadcast quality.